Joe Pooley specialises in surgery of the upper limb. He is a graduate of Newcastle upon Tyne medical school. 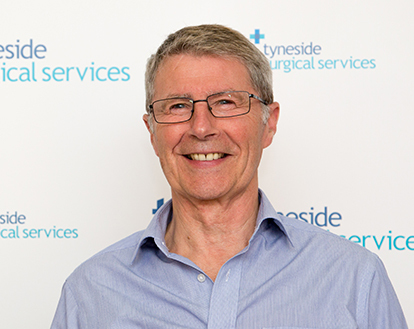 On completion of his specialist training he was appointed Senior Lecturer in Orthopaedic surgery and Consultant orthopaedic surgeon in the University of Newcastle upon Tyne/Newcastle upon Tyne hospitals. He subsequently moved to the Queen Elizabeth Hospital, Gateshead in order to develop a specialised upper limb unit. He gained an MD for his basic scientific work on bone circulation. He was awarded the British Orthopaedic Research Society’s medal and the British Orthopaedic Association prize and Robert Jones gold-medal. His clinical and scientific work on Elbow arthritis led to the development of the iBP total elbow joint replacement system and more recently the Lateral Resurfacing elbow (LRE) system which is now in use throughout the UK and Europe for the treatment of elbow arthritis. He was one of the original group of upper limb surgeons to begin to use arthroscopy for the treatment of shoulder and elbow conditions. This is now a large part of his current practice and he regularly teaches these techniques to younger colleagues. He continues to respond to requests to demonstrate his surgical techniques for the treatment of elbow arthritis and arthroscopic treatment to groups of orthopaedic surgeons at home and abroad. He publishes and presents work both nationally and internationally. He is also a reviewer for a number of scientific journals.